When making a stew, be sure to choose tougher cuts of meat (in other words less expensive) because they become tender and flavorful with long, slow cooking. I recommend making more than you need and freezing the rest for another dinner. When the meat is tender when pierced with a fork, transfer it to a warm serving platter. Boil in the sauce. If there is too much sauce, keep it boiling until you have enough to make a nice stew. If the sauce is too thin, add some more stock or water, and boil it for at least five minutes more. Taste and adjust the seasoning. Pour this over the meat and keep warm. To reheat the vegetables, place them in a large pan with a knob of butter, sprinkle with salt and pepper and reheat gently. 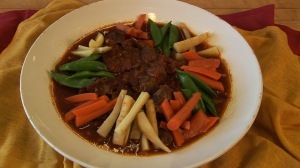 Arrange the vegetables nicely around the stew and serve warm. Note: You could brown meat this way for beef stew, substituting red wine for white, and mushrooms and onions for the spring vegetables. Or, you could brown meat this way for pork stew, using white wine and chicken stock, and garnishing with sautéed onions and red and yellow peppers, and some chili for heat.